How does the application work in real life? In order to start using Mobitee you need to create at least one golfer in the system. The process is simple and painless and then you can start using the application. On course Mobitee is an accurate GPS. The target selector allows you to pick out any target and get the distance to it, in the same way that advanced gps units like the SkyCaddie SGX allow. One of the nicest features of the application is a fly over of the hole. It’s perfect for holes with blind shots. As new courses are added, the application is automatically updated. There is no need to manually download any courses, as they are downloaded automatically when you want to play them. 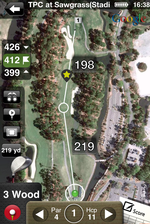 Overall, Mobitee is an excellent golf GPS. It compares nicely to stand alone units. While I can’t say that it is as accurate as something like a SkyCaddie, it is accurate for most recreational use. One glitch I ran into is that unlike traditional gps units, it’s best to turn off the setting for getting your location from wireless networks. This setting can interefere with the performance of the gps and provide some wrong yardages. Mobitee is priced at 24.90 for the full version. A lite version is good for showing you up to the first 5 holes on each course. One of my favorite uses for Mobitee is tournament or course preparation. Because you can see each hole and move the pointers around you can plan your on course strategy. It becomes like an interactive yardage book and it’s a lot of fun to do. This way you can plan angles and shots into the greens and give yourself an opportunity to shoot a low score. Mobitee has created a fun contest to win $250 just for downloading Mobitee Lite.